Upscale design from head to foot. Product Description Glorious Glamour. 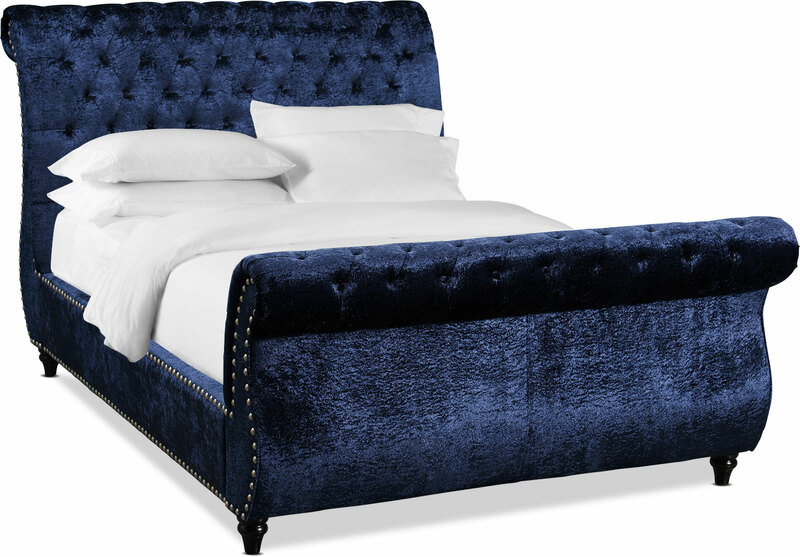 The rolled headboard and footboard on the Ella Queen sleigh bed in midnight makes a glamorous impression. Plush velvet upholstery upon dense padding has a gloriously rich feel. Button tufting with subtle, diamond-patterned stitching looks posh. Individually placed nailhead trim runs from the headboard to the footboard for an upscale feel. Low-profile foundation is recommended but not included. Customer assembly required. Unique Features: Velvet upholstery is irresistibly soft to the touch. Deep midnight color is reminscent of a dazzling night sky. Superior slat system lends tremendous support for today’s large beds. Button tufting and bronze nailhead trim bring a bit of class to this already classic sleigh bed. Construction: Furniture-grade plywood and hardwood solids ensure strength and stability.